Our quilting community is so generous and supportive. 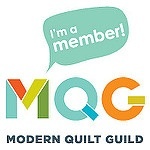 I came home from QuiltCon 2019 in Nashville inspired and energized (well, after I recovered)! Two long-standing projects had been inching towards a finish, and both were completed this week. Hooray! I’ll share one quilt in this post and the other in a separate post soon. The five highlighted projects at the top were carried over from previous years. 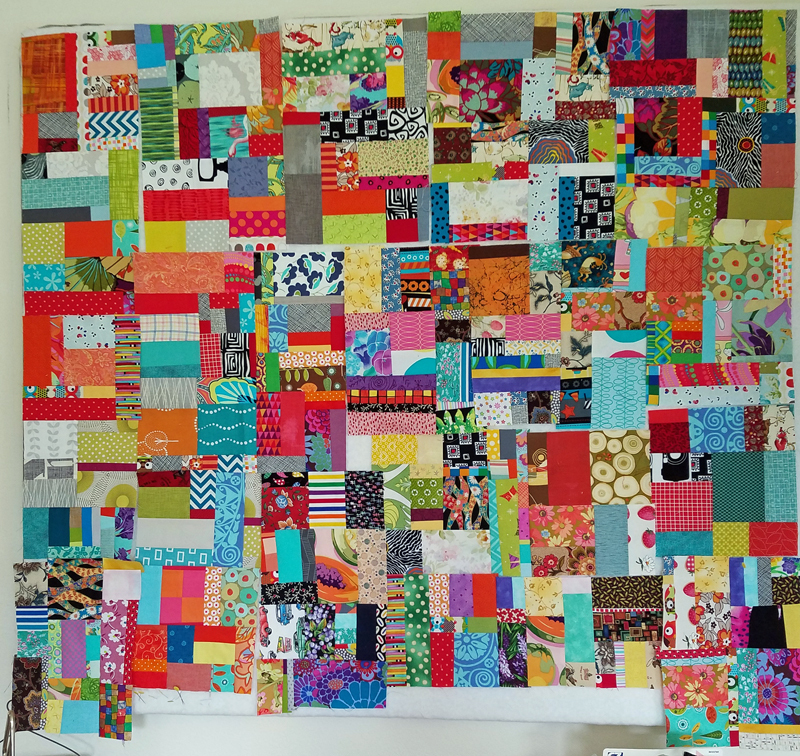 The first quilt’s humble beginnings began more than four years ago as a way to get my multicolored print scraps under control. 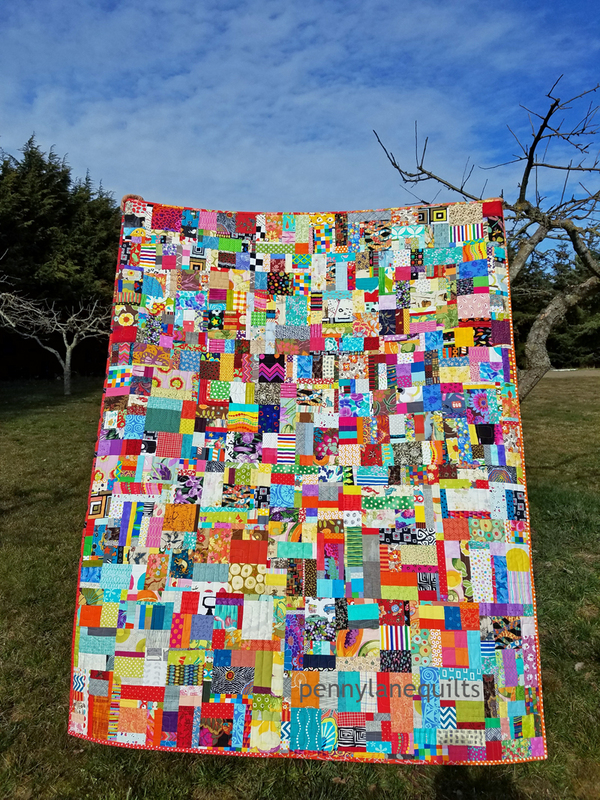 Amanda Jean who blogged at Crazy Mom Quilts wrote a post about her Scrap Vortex quilt in 2013 that inspired me. She also hosted a quilt along in 2015, so if you are interested there are lots of photos and instructions available. Occasionally, I would piece a slab or two, but the piecing was never high on my UFO priority list. In January, I won an edge to edge quilting during an Instagram giveaway from Lilo Whitener-Fey with Trace Creek Quilting. Her company specializes in t-shirt and memory quilts, as well as longarm services. We decided to have her quilt a top and we would donate it to a charity. I looked around for a top to finish and my scrap vortex came to mind. Lots of little scraps were used and I love to remember how each piece has been used in past projects. Of course, the quilt somehow didn’t diminish the scraps in the tub, but that seems to be the way with scrap quilts. The good news is I can make another one (or two or six)! Lilo provided the batting and quilted the top with a pattern called Geometric Path. Her turnaround time was very quick, she communicated efficiently and I appreciate her generous donation of time, batting and even return shipping. Check out Trace Creek Quilting for pricing and details and follow her on Instagram and Facebook to learn more about their quilts and services. All I had to do was trim it up and attach a binding and label. 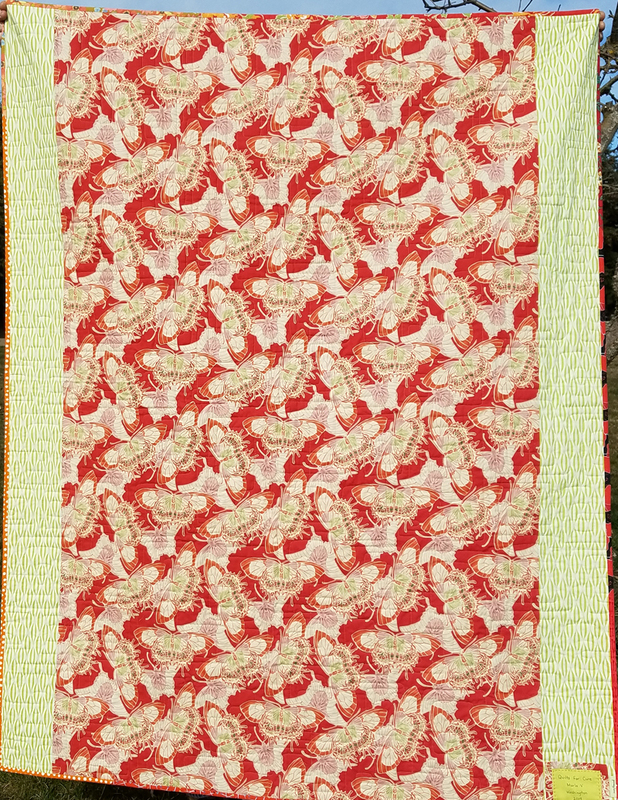 Since this quilt is so cheerful and has lots of prints, we decided to donate our joint project to Quilts for Cure. Their mission is to provide “quilts full of hope, love and smiles to kids fighting cancer”. 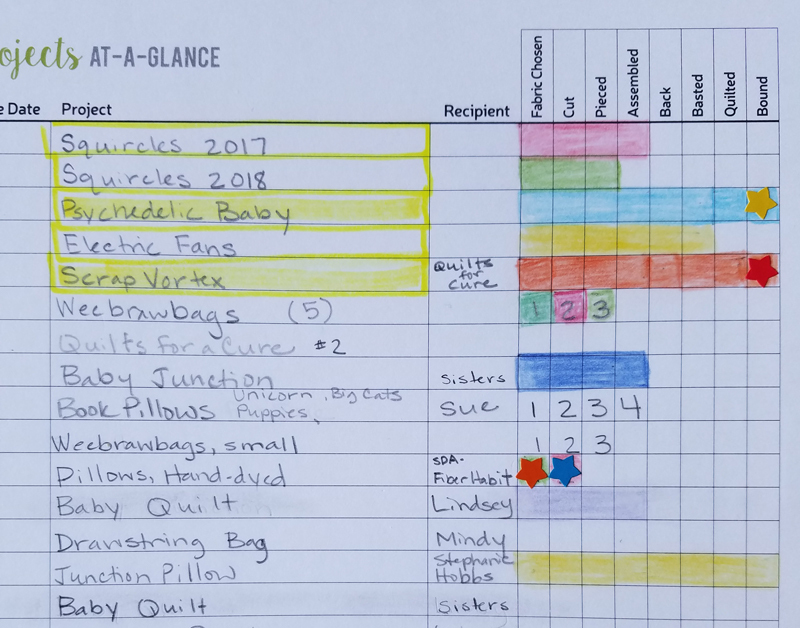 I met organizer, HollyAnne Knight at a previous QuiltCon and have participated in her annual “Operation Smiley” project which is happening now. Maybe you would like to contribute, too? There are lots of ways you can help this organization. Donate a quilt, donate quilting or donate money to help pay for materials and shipping. My hope is to donate at least one quilt each year to their cause. The quilt has been washed in a fragrance and dye-free detergent per instructions and will be mailed tomorrow. I sincerely hope it brings a bit of cheer to a child facing the challenges of cancer.